The Senior Band rehearses from 7:30-9:30 every Tuesday and Thursday. Band’s second visit of the year to Cheltenham. Once again the band travelled into England to participate in the Gloucester BBA annual march and test piece contest on 19th November. Competing in a combined section of 2nd and 3rd section bands, we chose the magnificent TJ Powel march “The Contestor” to open our account as third band on stage. 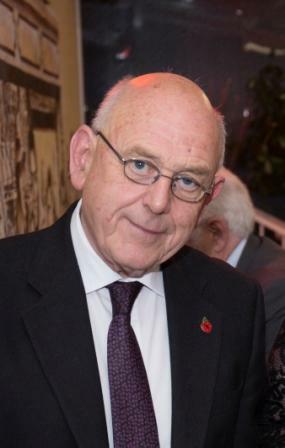 The adjudicator for the contest, Stephen Pritchard-Jones, found much to praise the band for, highlighting good balance, dynamic contrast and quality playing, placing us 3rd out of the nine competing bands. For our “own choice” test piece we performed Steven Ponsfords “Music of a Legacy” which we performed in Cheltenham in September. This time. However, the band secured third place on the day. The adjudicator praised the bands control, attentions to detail, musical balance and our three soloists (Karla Howe, Catriona Barr and Ian Howe). Musical Director, Sean O’Neil, was very pleased with the bands performance of both march and test piece stating that “it was a very well prepared and delivered programme”. He was also very pleased with another podium placing which should be seen by all, as yet another step in the band's musical development and growing performance standard. As rehearsals progress for the forthcomming contests in Cheltenham on 19th November and the S4C Band Cymru recording on November 26th, the band also has its eyes focussed firmly on the festive season. Traditionally a busy time for brass bands, Abergavenny is no exception with performances at the towns Christmas Food Festival, Hospice of the Valleys Light-Up-A-Life service in Ebbw Vale, fundraising concerts in the town and at Waitrose Supermarket and our annual Christmas Concert at the Borough Theatre on 15th Decemmber. The Band always enjoys playing for the people of the Town and looks forward to contributing to their Yuletide spirit again this year. Let the Carol's begin! The near 2hr trip to Burry Port on Saturday 7th October for the West Wales Brass Band Association Championships, turned out to be a fruitful visit to this picturesque part of Wales. Competing in the Welsh 1st Section this time, the band chose to play the same test piece as in Cheltenham and gave a much more confident and musical performance of Steven Ponsford’s “Music of a Legacy”. This resulted in adjudicator, Ian Porthouse, awarding the band 2nd place, one point behind Lewis Merthyr Band. There was much he commended the band on in his written remarks, stating it was “overall a well organised performance shaped well by the M.D”. 16th best second section band in the UK – We’ve had worse days. Our visit to Cheltenham Racecourse on 16th for the section two National Championships of Great Britain turned out to be a strangely “cubic” experience. Eighteen bands competed from all over the country in the final of the championships for which we qualified in Swansea last March. The test piece was Steven Ponsfords “Music of a Legacy”, a composition that challenged the musicality of bands with several themes taken from the Salvation Army repertoire. Adjudicators were Tom Davoren and Paul Holland. A Cubic experience because the contest date was the 16th, we drew 16th in the order of play and we came 16th in the results. But MD Sean O’Neil pointed out to the band that as this was the National Finals with bands from all over Britain competing for success there were extremely narrow margins with which bands can be separated. He congratulated the band on a sterling performance which represented a big step forward in the bands musical development. As summer approaches and the warm sunshine attracts the band to parks and country shows, band stands and fundraising, the serious job of preparing for the biggest contest in the bands recent history is well underway. With several rehearsals on the National Finals test piece “Music of a Legacy” under our belts and sectionals also started, the Band is working hard to represent Wales in Cheltenham in September. But Cheltenham is not the only task in hand. Following the National Finals, players are really excited about the next contest in Merthyr when they will be asked to give their account of that famous of Gilbert Vinter’s test pieces, “Spectrum”. A truly challenging composition, this will stretch all players in the band and get their pulses racing with the exciting music. So as we move towards our summer recess, there’s masses of home practice to be done in readiness for the autumn contests. Yes, it does happen, and this Sunday it was certainly “Scorchio” as the band paid its annual visit to Bedwellty Park in Tredegar on Father’s day, it was greeted by clear skies and soaring temperatures. This was in marked contrast to our experience in 2016 when a dank and dismal day in July dampened our spirits. This time though, there was not a drop of water in sight; except for the many bottles around the bandstand to refresh us in the blistering heat. Our resident conductor, Lana Tingay, took the concert and treated the hundreds of “Tredegarites” to a concert with a light, entertaining programme featuring excellent soloists, duettists and the Trombones, all four of them!! The Trombones gave a splendid rendition of (and they were short 72 players) “76 Trombones” from the 1957 Musical “The Music Man”, and as if that wasn’t enough, Solo Trombone player, Ian Howe gave a splendid delivery of “The Acrobat”. Duettists, Aled Daniels and Andrew Richards, played the Euphonium arrangement of “Deep Inside The Sacred Temple” and other solos were performed by Jon Mudd (I Don’t Know How To Love Him) and Jacqueline Llewellyn (She’s the One by Robbie Williams). More upbeat numbers were chosen for the Horn section who were featured playing “Rete Petite” and the cornets who gave us “Cornet Rock”. For the people of Tredegar, we can’t think of a nicer way to spend a sunny Father’s Day afternoon. 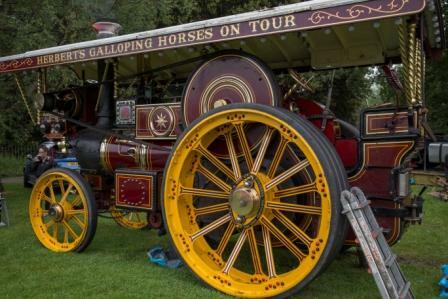 Another great bank holiday weekend for the Steam Rally in Abergavenny’s Baily Park as the air filled with the smoke from fire boxes and the sounds of steam driven pistons and wheels. 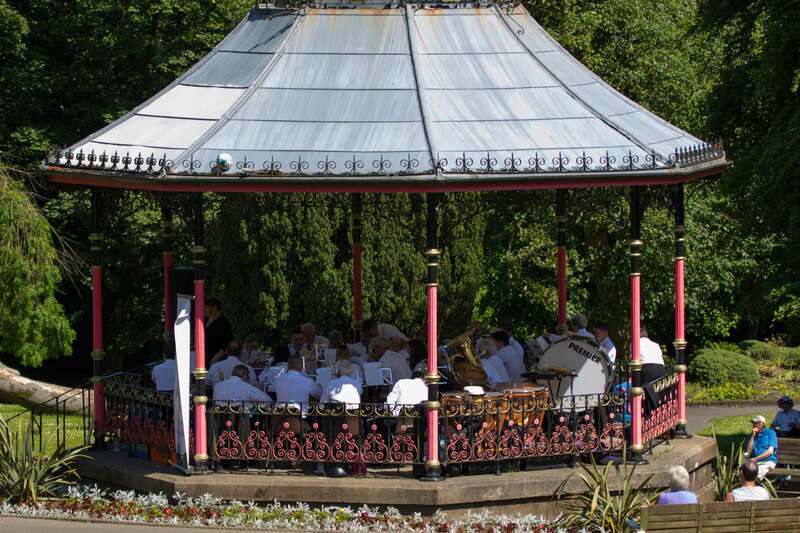 Amongst the sounds from the Hurdy Gurdy man (complete with monkey) and the giant steam powered musical organs, the band took to the bandstand to add Brass Band music into the mix. On Sunday the senior band drew an appreciative crowd who delighted in MD, Sean O’Neils, chosen programme of band music and solo performances. The band featured the Euphonium Duet, Deep Inside the Sacred Temple, the evocative Baritone Solo, Donegal Bay, Trombone Solo The Acrobat, and the Flugel Horn solo, I Don’t Know How to Love Him from Jesus Christ Superstar. But, as you’d expect, the show was stolen by the Youth Band on Monday under the baton of Colin Roberts. Some 25 youngsters played music from the Beatles, Ton Jones, Blues Brothers, The Proclaimers and many more popular performers. The crowds soon gathered round to enjoy the obvious talent of the Youth Band, and some joined in with impromptu accompaniment on various percussion instruments. Once again, one of the favourite engagements in the Bands calendar turned out to be a great success and we were privileged to add to the smoky, noisy atmosphere that is the Steam Rally. Weeks of hard work were rewarded with a third place at the SEWBBA Spring Contest in Merthyr on Saturday 6th May. Jousting with the work of composer, Edward Gregson, MD Sean O’Neil was able to draw on the 15th century, medieval themes so cleverly woven into this classic brass band test piece. Sean was able to instil this imagery into the band who responded with a powerful musical performance. Adjudicator, Melvin White, complimented the band on its strength and power and congratulated our soloists who were all exceptional on the day. Sean O'Neil complimented the band saying "overall it was an excellent performance and another great step forward for the band as a whole. Every single player in the band was asked a musical question and everyone stepped up. As Melvin White rightly commented"well done soloists, you are very exposed" This was a very testing piece, not only for soloists but demanding musical challenges throughout the band of duets, quartets, not many works will ask for a tuba quartet, soli passages for horns and trombones and lots of cornet fanfares, each with their own complexities of balance and intonation. No hiding places for any member of the band, each player under scrutiny of technique and musicianship". He added "we learned a lot from the performance and just what it will take to represent Wales as Area Champions at the National Finals in Cheltenham later in the year. A challenge it certainly is, but one that I am extremely confident we are capable of surmounting with everyone's enthusiasm dedication and hard work. A really good experience. Well done to all the players". The band was pleased to learn that it has been promoted to the 1st Section in the National Gradings. This is the result of hard work by all in the band culminating in a 1st place at this year’s Regional Championships in Swansea, placing it at the top of the second section table. In 2018 the band will join Ebbw Valley Brass, Llanrug, Tylorstown, BTM. Markham & District, Thomas Coaches Mid-Rhondda, Deniolen and Lewis Merthyr bands in the 1st section at Swansea. MD, Sean O’Neil was delighted with the news and congratulated everyone in the band for their contribution to the recent successes. Band Chairman, Terry Prosser, echoed Sean’s comments and added that the strong direction of the MD gave everyone in the band a sound platform from which to build for the future. Everyone is very up-beat and is looking forward to the challenges 2017 will bring on the contest stage. The warm April sunshine greeted the band as it played for the shoppers in Abergavenny Town Centre on Saturday 8th April. The senior band, under the baton of resident conductor, Lana Tingay, started the mornings music making and played an eclectic mix of items from traditional to contemporary popular genre’s lifting the spirits of the town’s shoppers. 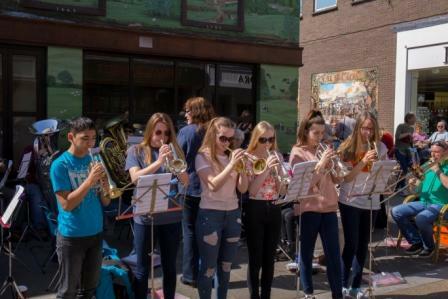 Again, under the direction of Lana, who is also the Youth Band’s MD, our youngsters took over from the seniors and delighted a very appreciative crowd of onlookers who showed their appreciation by swelling the band’s “coffers” through donations in the collecting tins. There were even people dancing in the streets. Well done all. Photos from the morning can be seen by clicking here. After playing a controlled and polished rendition of dean Goffins’ 1949 Test Piece, Rhapsody in Brass, there was an anxious wait for the announcement of the contest results after the 7th band concluded the second section. The words we all wanted to hear were “Band number four” and it was worth the wait to hear it announced three times. First was the award of the best instrumentalist in the section...”the band that played number four”. Our solo Horn player, Deb Bull, having delivered a superb melody in the second movement of the piece, was rewarded with the well deserved accolade from the adjudicators. Then there was the prize for the best percussion section....”the band that played number four” were the words from the announcer. A tribute to our three percussionists made all the more astounding as Lauren, Rhys and Jackie had only played together three times in as many rehearsals. Well done all. 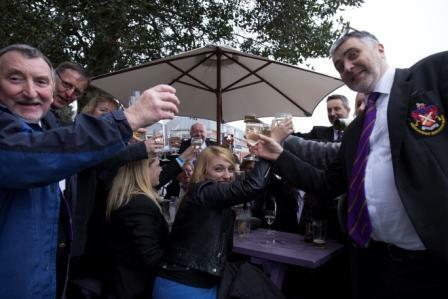 With half the band in the pub watching Rugby it was left to a few of us to chew the fingernails as we awaited the final announcement.....”the band that played number four” and we all leapt from our seats to cheer and applaud as band Chairman, Terry Prosser, received the silverware on stage. Adjudicator, Mike Kilroy, described our performance as one with style and musical merit whilst Derek Broadbent commended the bands rendition. Both adjudicators praised the bands control of the test piece and congratulated the soloists for their excellent work. 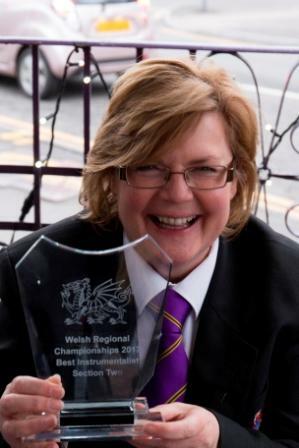 Musical Director, Sean O’Neil, said “This is a richly deserved result for Abergavenny Borough Band in Swansea. Huge congratulations to Deb Bull on winning 'Best Horn' award and the Percussion Team of Jackie, Lauren and Rhys on their award for 'Best Percussion Section'. What a fantastic achievement for the Band, 'Welsh 2nd Section Champions' I am sure the Band will represent the Principality with great distinction and pride when we go to the National Finals in Cheltenham next September. This result is all down to the total dedication and hard work of the members and the fantastic 'team work spirit' that all bring to the Rehearsal Hall. Brilliant result, onwards and upwards”! 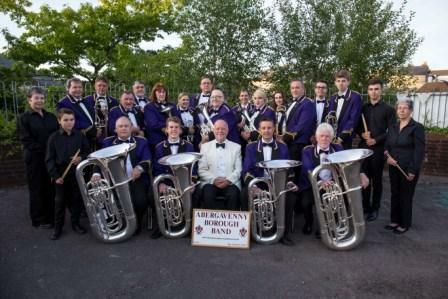 Band Chairman, Terry Prosser, commented "It`s been 15 years since Abergavenny Borough Band have been able to lay claim to the title Welsh Regional Champions. During those 15 years there have been some difficult times but the tenacity of players and committee has enabled the band to weather the storms. 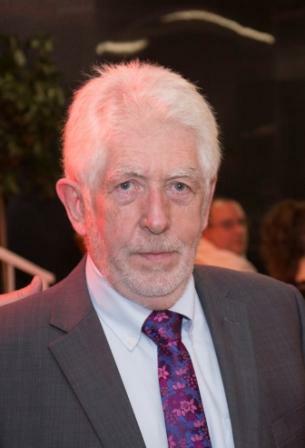 The appointment of Sean O`Neill in late 2016 marked a turning point for the band. 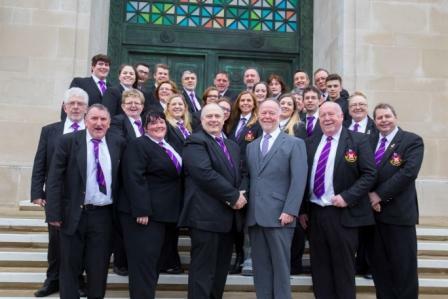 His professionalism, musicality and empathetic approach to players gave renewed enthusiasm and determination and under his guidance the band once again were awarded the title of Welsh Regional Champions at the Brangwyn Hall on Saturday. As the icing on the cake our talented horn player, Deb Bull gained the title of best instrumentalist and with the award of best percussion section we swept the board. Abergavenny Band is on a long overdue upward curve. I have been involved in the brass band movement for almost 60 years and played from Youth level through to championship section National Finals, Open Championships and European Championships, playing with Abergavenny is a sheer joy, it`s what brass banding is all about, making good music with good mates. Long may it last". The band will be representing Wales in the second section on 16th & 17th September at the Centaur, Cheltenham in the National Championships of Great Britain. At the AGM on Thursday, Band President, Alun Griffiths, and Chairman, Terry Prosser, congratulated the band on a successful year in concerts and competitions. Alun thanked the band for its magnificent record of representing the town of Abergavenny both locally and wider afield and praised the dedication of officers and committee for their hard work on behalf of the band. Terry also praised the band for the way it pulled together through some difficult times, mentioning the departure of MD Alun F Williams for personal reasons, but also the way the band has responded to the new MD, Sean O’Neil. Terry added that confidence is high and there is a good deal of optimism and an excellent spirit in the band which can only bode well for the future. MD, Sean O’Neil, stated how proud he is to be associated with the band and how delighted he was to be asked to become the bands MD. He praised the band for its prize winning performances and individual soloists, Diane Mogford and Aled Daniels as well as the entire horn section for their awards at contests. He pointed out that the band has embarked upon a significant upgrade to the concert programme for the future adding some 55 new pieced of music to the rehearsal folders. Sean concluded by looking forward to concert and contest performances with great optimism and hopes his association with the band will extend long into the future. Youth band MD, Lana Tingay, said how delighted she is with the progress of the youth players with some now moving across to the senior band. However, she remains disappointed that the youth band has not participated in as many concerts and contests in its own right, something she is determined to put right. Never the less, Lana was thrilled with the first Master class in November, organised for the youth players from Abergavenny and other bands. Band treasurer, Jonathan Tingay, gave a very positive financial report which was endorsed by band auditor, Michael Cleaves. The band is very grateful to our president, Alun Griffiths, and his staff for the excellent work carried out at the band room. With a new “ramped” access, double doors and reconfigured toilet facilities, the premises are now much more accessible to people with disabilities. 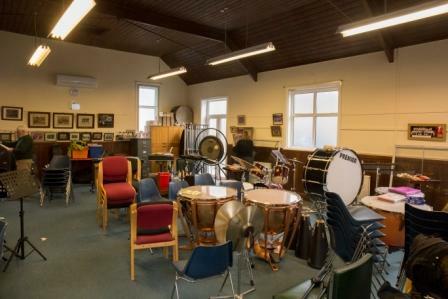 A fresh coat of paint has brightened the ambiance and with the air conditioning Alun had installed last year, the band room is definitely a fine facility for music making all year round. The Band is saddened at the loss of a former player and committee member, Andrew Moss. 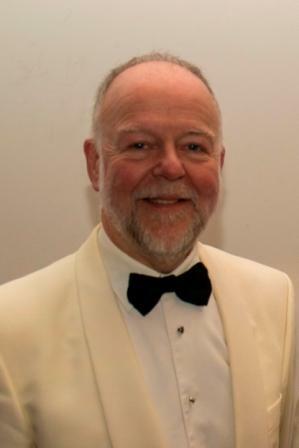 Andrew joined the youth band in 1972 under the tutelage of Bandmaster, Eric Powel. 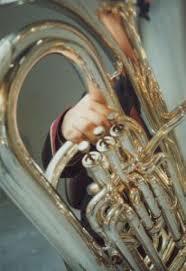 He played trombone, baritone and euphonium in the senior band and served for several years as Band Manager. It was through the band that Andrew met his wife Mandy in 1975 when she was 16 years old. They have been together ever since and were married in 1981. Together they had three sons, Paul, Peter and Tom and have one granddaughter, Ella Jay. Pictured here are Andrew & Mandy on their first date. Andrew passed away on January 26th, peacefully at home with his loved ones around him. He said he had many happy memories of the band and the friends he made during his playing career, the highlight of which was playing at the Royal Albert Hall in 1985. The band will be playing at Andrew's funeral at St Mary's Church, Abergavenny and will be joined by several former players from Andrews' time with the band. The new year is off to a flying start with the first rehearsal under the bands new MD, Sean O'Neil. It was great to see a full bandroom after the festivities and also to welcome some new players to the fold. In his message to the band, Sean said how much he is looking forward to 2017, to building on the fantastic achievements in 2016 and putting a new programme of music together for our audiences throughout the new year. He congratulated the band for its spirit and hard work ethic. We now focus on the Swansea contest in March with confidence and look forward to 2017 with eager anticipation.